In the years following World War II, as the interstate highway system began to grow, flocks of Americans started driving into the great outdoors to picnic and camp. Recognizing this trend, in the early 1950s, President Dwight D. Eisenhower enacted dozens of orders exempting certain federal lands from any use other than recreation. One of those places is the U.S. Forest Service’s Oak Flat campground in Arizona, about an hour east of Phoenix. 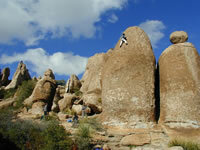 The area attracts birders, hikers and campers, and its massive, wind-chiseled boulders lure climbers. Since 1989, it’s played host to the Phoenix Boulder Blast, one of the largest climbing events in the world. But recently, the United Kingdom’s Rio Tinto Company, a mining giant that earns $2.8 billion annually, got wind of what could be one of the continent’s largest copper deposits, located below Oak Flat and nearby Superior, Ariz. Eager to develop it, Rio Tinto and Australia-based Broken Hill Proprietary Company Ltd. formed a subsidiary called Resolution Copper Company, which plans to invest $2 billion to mine the copper. The company has proposed trading private property for the Oak Flat campground. Because the trade would involve both the U.S. Forest Service and the Bureau of Land Management, Congress would have to pass a bill authorizing the deal. Such a swap, called a legislative land exchange, is not subject to the National Environmental Policy Act, which requires in-depth environmental analyses and public involvement. "The executive order (from Eisenhower) didn’t say, ‘protect until a bunch of ore is found,’ " says Jason Keith, policy director of the Access Fund, a nonprofit that works to keep climbing areas open to the public. "(It said) ‘protect from mining,’ period." Resolution Copper already owns more than 4,000 acres surrounding Superior, as well as an abandoned mine just west of Oak Flat. Resolution plans to use that mine’s existing shaft to determine whether it is feasible to extract copper from 7,000 feet below ground, where temperatures reach 175 degrees. Should exploration prove fruitful, the company wants to extract ore with a "block caving" technique. According to mining engineer George Lopez, this involves drilling tunnels into the ore body, then blasting with explosives to create a cave. The process is repeated at several different levels, or blocks. After the ore is removed, the cave collapses in on itself, layer after layer, until the ground surface also collapses, or "subsides." "Restoring the surface to pre-mine (condition) is impossible," Lopez says, and no one can predict what the land above Resolution’s proposed mine — including most of Oak Flat — will look like when the mining is done. Since 2003, Resolution has spent $35 million on exploration and on public relations in Superior and nearby towns. The company has offered to teach copper-mining skills to locals. "It’s really important that Resolution hire as many locals as possible," says Ron Ober, a public relations consultant to Resolution. "We’re going so far beyond the call of duty." Resolution has also hired Jim Waugh, who coordinates the Phoenix Boulder Blast, and renowned climber John Sherman to scout for land that climbers might find acceptable in exchange for losing access to Oak Flat (HCN, 7/7/03: Invasion of the rock jocks). But some locals say the trade would sacrifice long-term recreation opportunities for short-term financial gain. "The economic benefits of mining are not sustainable," says Ted Gartner, a member of Friends of Queen Creek, a nonprofit group devoted to protecting access to natural areas around Superior, including Oak Flat. Superior’s mayor, Michael Ong Hing, says he is "intrigued by Resolution’s openness to people," but he’s also wary — the town’s economy collapsed in the early 1990s, after the last mine boomed and then busted. Hing is concerned about the mine’s possible environmental impacts, and he sympathizes with the climbing groups. But, he adds, the climbers don’t benefit his community the way a big copper mine could, and they also create some impacts of their own: "They had professional vendors at the Blast, and we picked up their garbage after the event." Meanwhile, Resolution has hired land-exchange consultants from the Denver-based Western Land Group Inc. to draft a bill. The proposed bill, leaked to the Access Fund in early March, lists 4,814 private acres that the company would purchase to trade with the Forest Service and the BLM for the 760-acre Oak Flat and 2,265 other federal acres nearby. Last year, the Western Land Group worked on another controversial legislative land swap that would have allowed an Arizona rancher to trade some of his property for Forest Service land near five northern Arizona cities, including Flagstaff (HCN, 3/1/04: Arizona land swap dogged by questions). Opponents of the Yavapai land swap worried that growth spawned by development of those lands could strain regional water supplies, and they objected to the fact that the legislative land-swap process kept the public from having a say. In January, the Arizona congressional delegation introduced a bill for the Yavapai land exchange, but it has yet to pass. The Resolution bill is unusual among land exchanges, because it seeks to overturn an executive order withdrawing land from mining, according to Janine Blaeloch of the Western Land Exchange Project, a watchdog organization. And, the Access Fund’s Keith says, "If they start pushing aside withdrawals in Arizona, they can do it anywhere." A spokeswoman for Sen. John McCain, R, says the senator has not yet decided whether to sponsor the bill; representatives for Sen. Jon Kyl and Rep. Rick Renzi, both Republicans, did not return phone calls. Despite the current lack of support, Resolution’s communications director, Jennifer Russo, is optimistic that Congress will approve the deal. "I do know that that the current growth rate in demand for copper is increasing substantially worldwide," Russo writes in an e-mail. "If developed, the Resolution project will have significant, positive impacts on current copper deficits."